Now everything's supposed to be getting better though: The loss of the unborn seems to have been a wakeup-call for Chris and he persuades Maggie to give it another try, in a totally different enviroment - a big house in the middle of the woods, miles and miles away from the next city, their only company being the retired couple next door - who keep to themselves mostly. 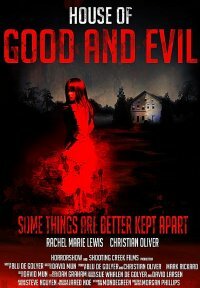 House of Good and Evil is an extremely likeable horror film that's old fashioned in the best of ways: In a word, it's just creepy - it doesn't try to impress with too-elegant-to-be-true camera pans, flashy editing, over-the-top CGI effects or by taking us to the slaughterhouse, instead it puts its emphasis in creating an atmosphere of unease in the most subtle of ways, through noises, dramaturgical hints, and of course also the performance by Rachel Marie Lewis, which the whole movie revolves around of course. And add to this a well-structured screenplay (which might not always make 100% sense ... but for a reason) with a kickass unexpected ending, and you've got yourself a pretty good, pretty spooky little film.